We have 2500+ carpets in stock in our warehouse in Rhode Island with particular focus on the Arts & Crafts genre. Also 400+ designs are in 10 different programmed sizes to choose from. Still, sometimes only custom rugs will do. A hand-knotted carpet will remain in the home for a very long time, therefore it has to be right. Visitors to our site may select any one of the designs featured and have it produced in any size, shape or colors they choose. Here’s how it works: For those customers who wish to have a custom-sized carpet produced, we forward rug samples from our Lending Library. Once a size or shape is chosen, we produce a computer-generated custom color rendering. This will show you how the design will look in a given size/shape. For those customers who wish to have a custom-colored carpet produced, we forward our Tiger Rug Co. Custom Pom Box 260. 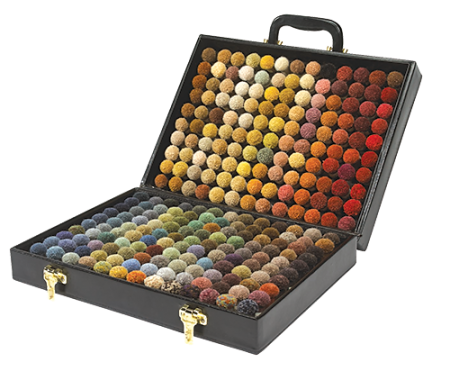 The box contains, you guessed it, 260 colors from which to choose. Once the colors are chosen and direction is given as to where the replacement colors are to be placed, a computer-generated custom color rendering is produced and forwarded for initial approval. Two renderings for each design are provided at no charge. The purpose of the rendering is to allow the customer to view how the newly designed pattern and/or colors will lay out. Once approval of the rendering is received, a color print version with the actual yarn strands attached is forwarded to the consumer via our shipper or the postal system. Because only the actual yarn strands can show the true colors. Print page and computer monitors are certainly helpful, but print and digital can only capture so much color. Therefore yarn strands attached to the color rendering are essential to the decision-making process. Once all elements of the newly designed carpet receive final, written approval, the weaving process can begin. © 2019 Tiger Rug All Rights Reserved.